We start by loading the required packages. 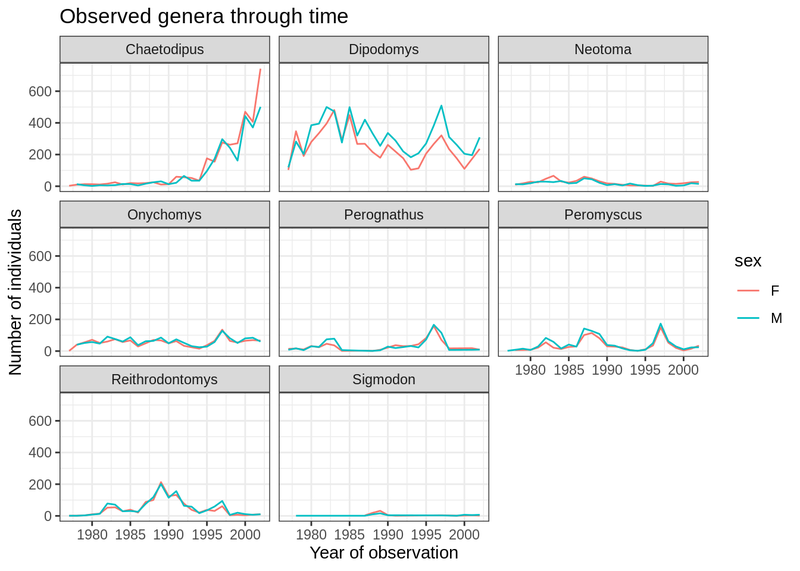 ggplot2 is included in the tidyverse package. 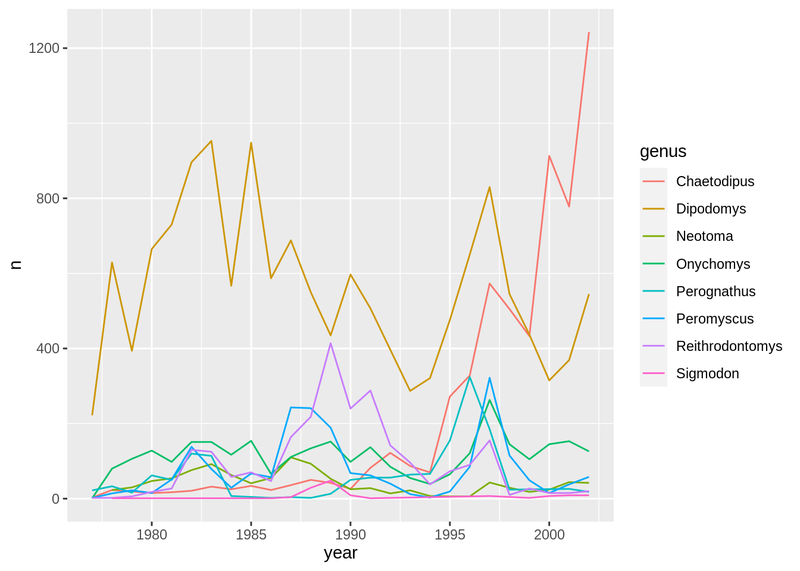 ggplot2 is a plotting package that makes it simple to create complex plots from data in a data frame. It provides a more programmatic interface for specifying what variables to plot, how they are displayed, and general visual properties. Therefore, we only need minimal changes if the underlying data change or if we decide to change from a bar plot to a scatter plot. 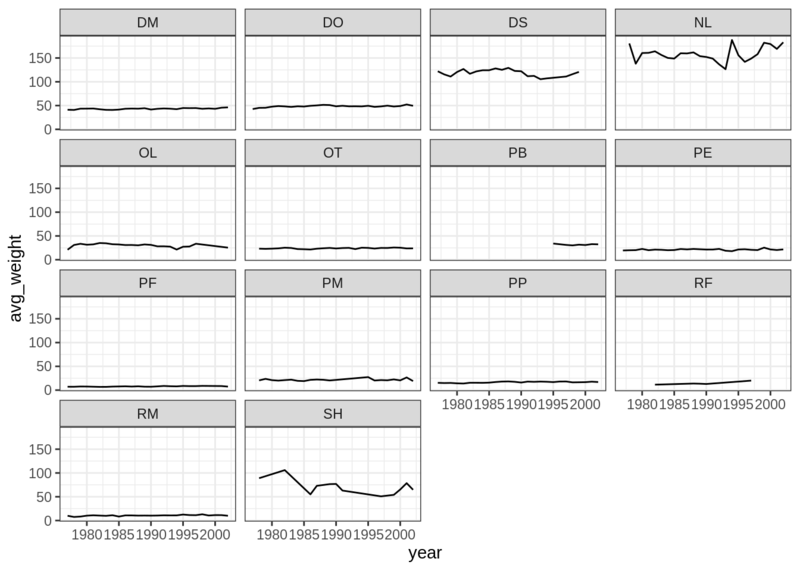 This helps in creating publication quality plots with minimal amounts of adjustments and tweaking. 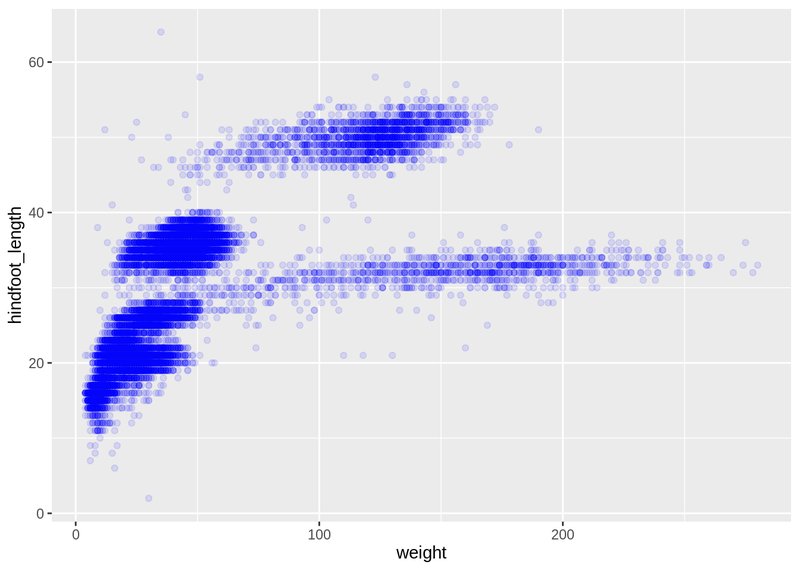 * `geom_point()` for scatter plots, dot plots, etc. 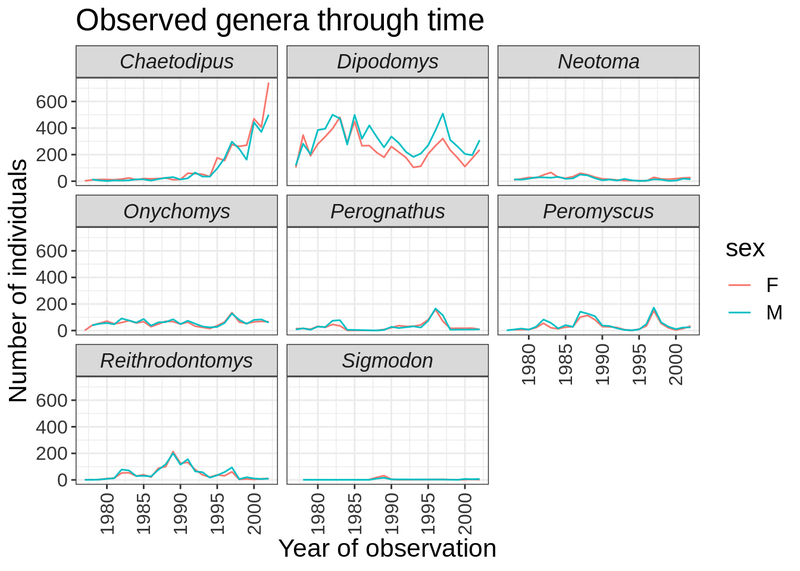 * `geom_boxplot()` for, well, boxplots! 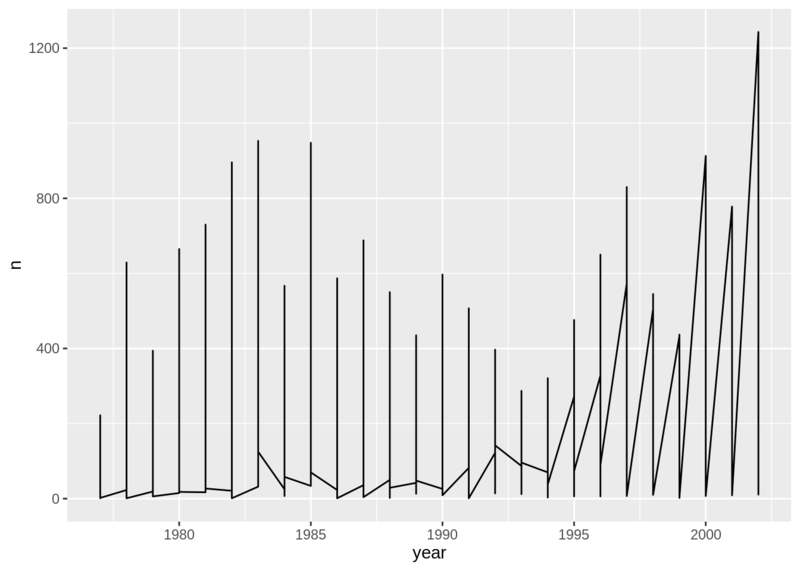 * `geom_line()` for trend lines, time series, etc. 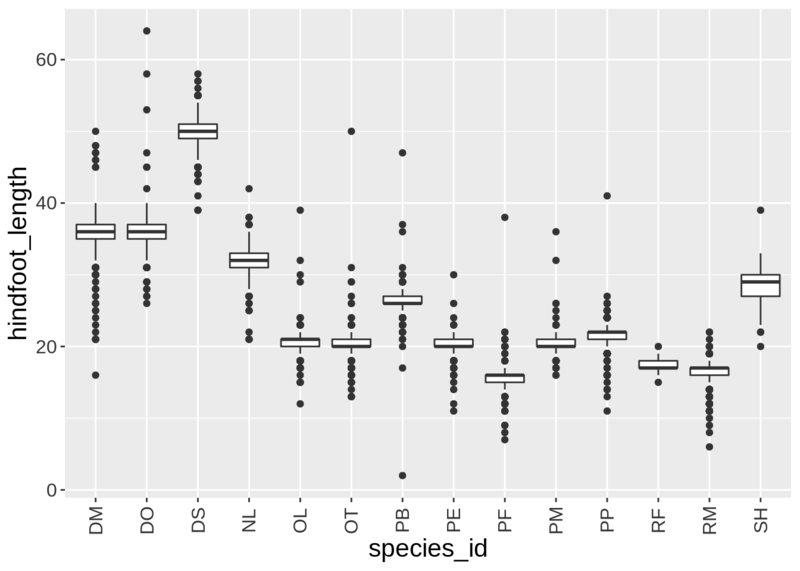 You can also specify mappings for a given geom independently of the mappings defined globally in the ggplot() function. 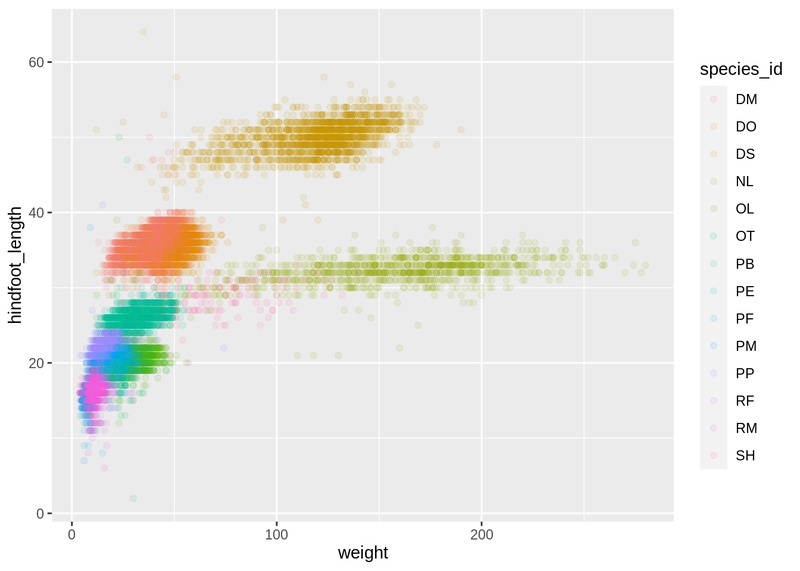 What are the relative strengths and weaknesses of a hexagonal bin plot compared to a scatter plot? Examine the above scatter plot and compare it with the hexagonal bin plot that you created. 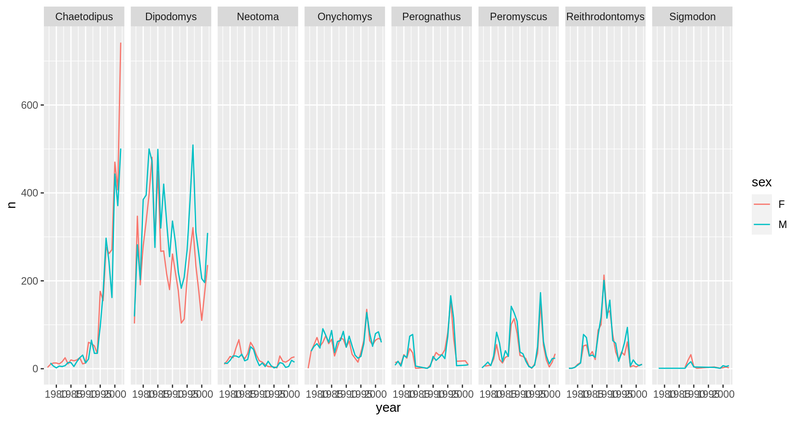 We can also specify the colors directly inside the mapping provided in the ggplot() function. This will be seen by any geom layers and the mapping will be determined by the x- and y-axis set up in aes(). 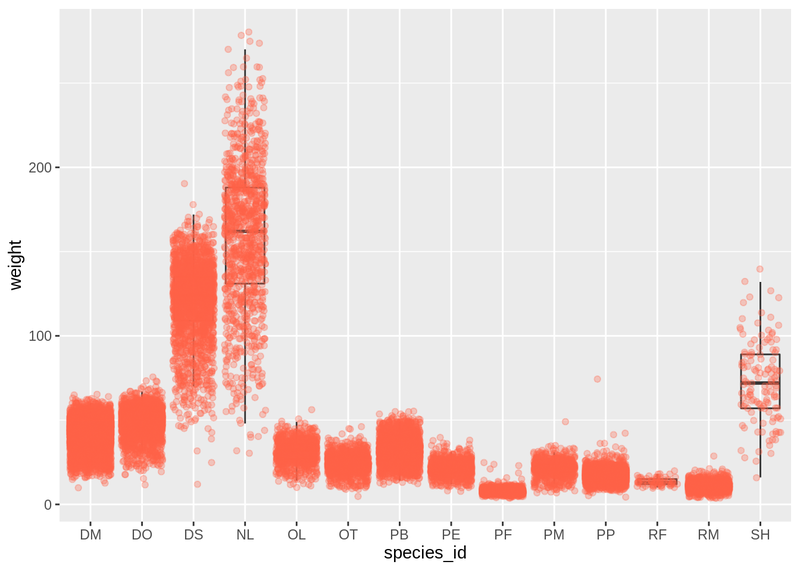 Use what you just learned to create a scatter plot of weight over species_id with the plot types showing in different colors. Is this a good way to show this type of data? 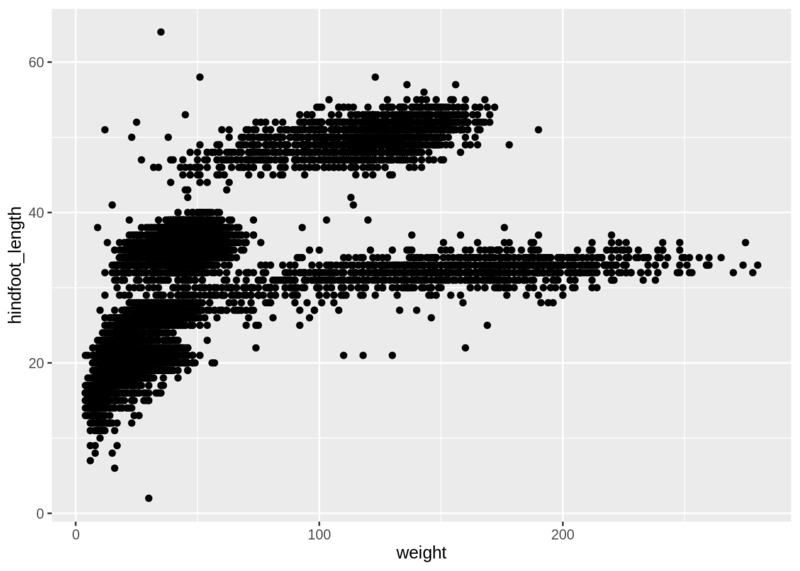 Represent weight on the log10 scale; see scale_y_log10(). 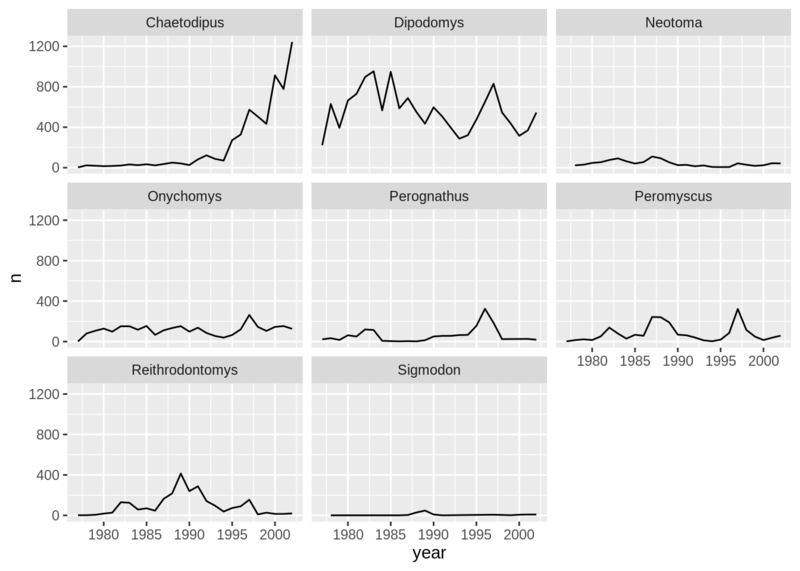 So far, we’ve looked at the distribution of weight within species. 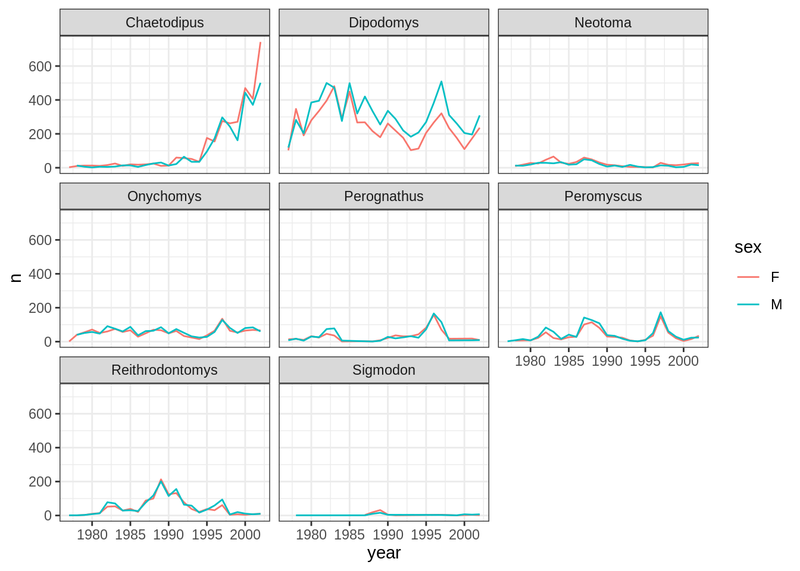 Try making a new plot to explore the distribution of another variable within each species. Create a boxplot for hindfoot_length. Overlay the boxplot layer on a jitter layer to show actual measurements. 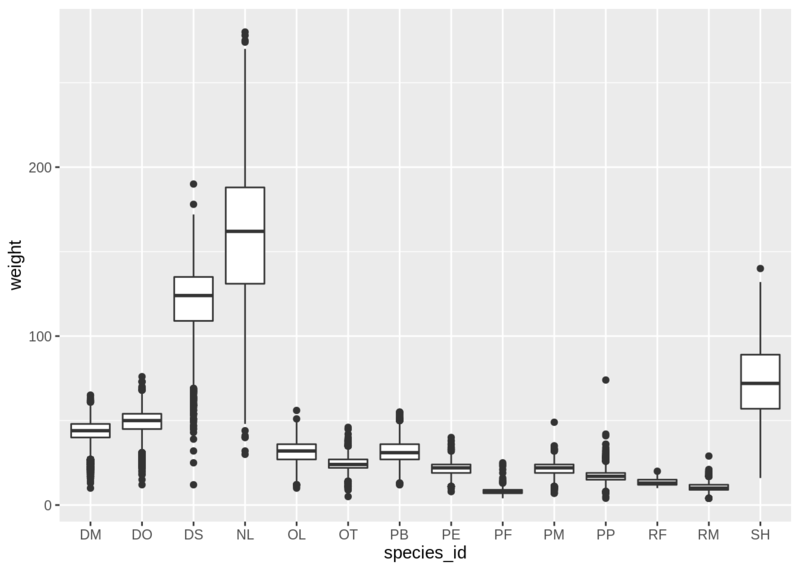 Add color to the data points on your boxplot according to the plot from which the sample was taken (plot_id). Hint: Check the class for plot_id. 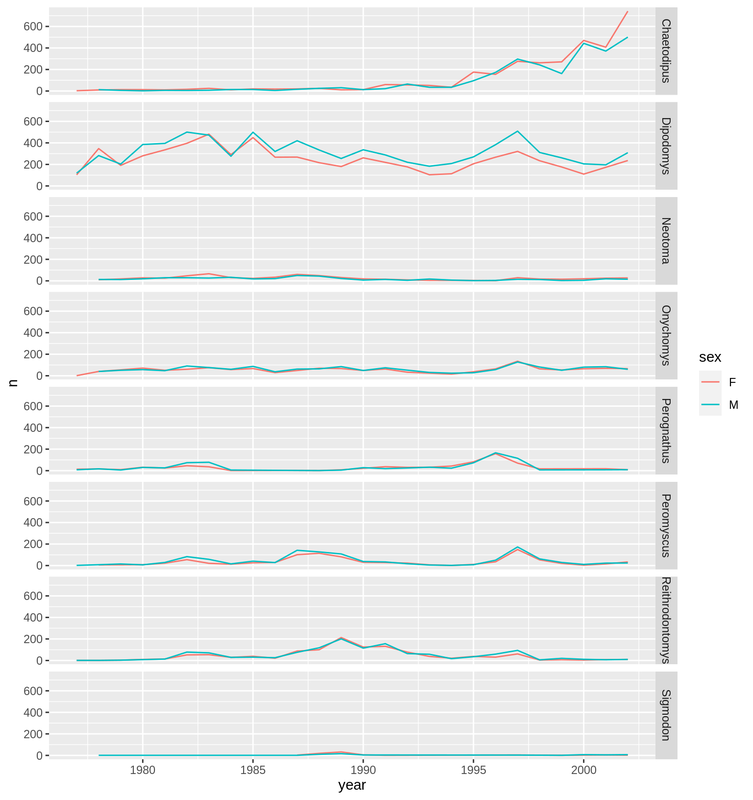 Consider changing the class of plot_id from integer to factor. Why does this change how R makes the graph? 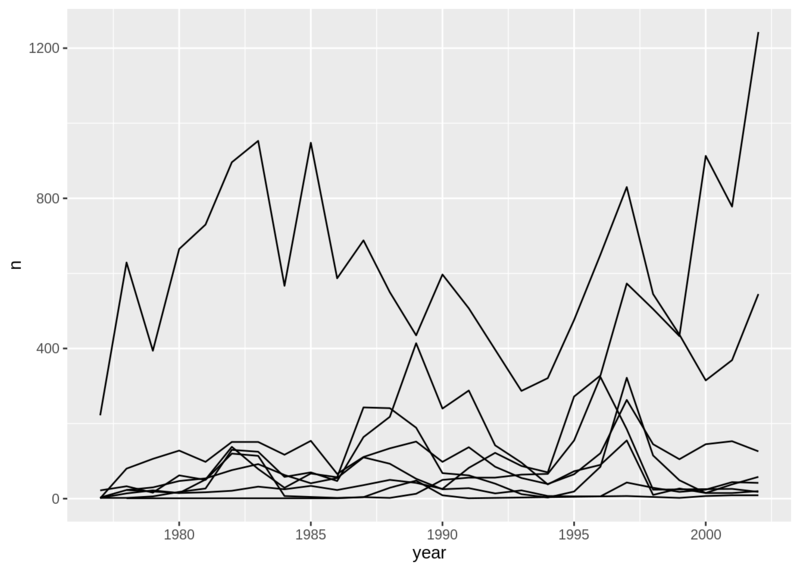 In addition to theme_bw(), which changes the plot background to white, ggplot2 comes with several other themes which can be useful to quickly change the look of your visualization. The complete list of themes is available at https://ggplot2.tidyverse.org/reference/ggtheme.html. theme_minimal() and theme_light() are popular, and theme_void() can be useful as a starting point to create a new hand-crafted theme. 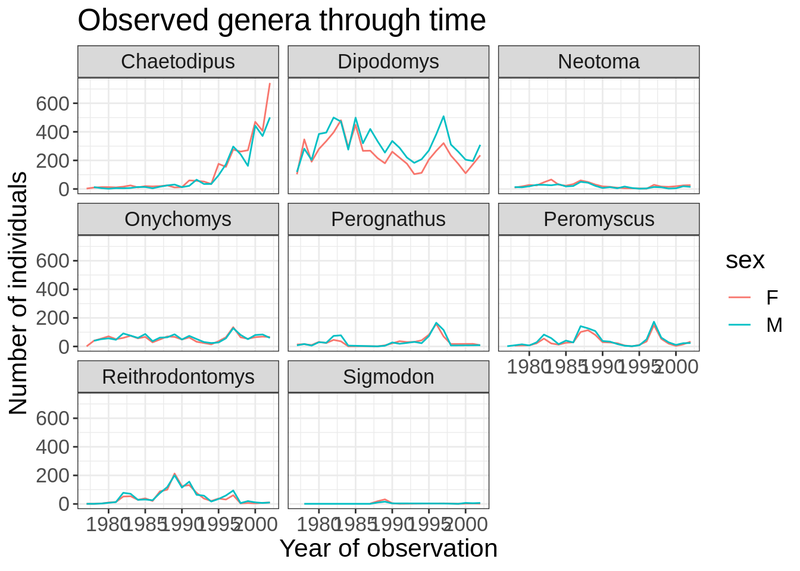 Use what you just learned to create a plot that depicts how the average weight of each species changes through the years. See if you can change the thickness of the lines. In addition to the ncol and nrow arguments, used to make simple arrangements, there are tools for constructing more complex layouts.